Briefcase solar panels are two solar panels fitted inside a hard case which folds up on itself. Briefcase solar panels are suitable for use when on the move, for example with campers, tarilers, or tents, when no mains hookup is available. The case provides good protection to the delicate solar panels when not in use. When closed the equipment is slim and easily transportable. 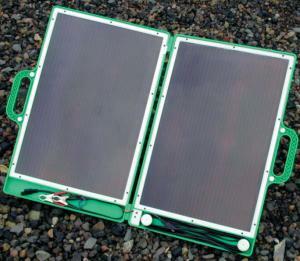 Towsure (www.towsure.com), for example, offer briefcase solar panels that measure just just 53 cm × 40 cm × 5 cm when closed. The panels can be propped up on a support leg in order to face the sun; for the best output, the panels should be realigned periodically to track the sun across the sky. Long leads with detachable connectors including crocodile clips are provided, so that the panels can be used to charge an auxiliary or vehicle battery. The Towsure solar panels are 13 W, enabling a theoretical maximum output of 1 amp in bright sunlight, though in practice the current will be slightly lower. When the device is active, a LED blinks to let you know it's working. The panel comes complete with a blocking diode to prevent reverse charging: when the panel is able to supply power to the battery, the diode lets it through, when the panel cannot supply power (at night or in bad weather) the diode prevents the battery discharging back through the panel. Unless you plan to leave the panels charging your battery for long periods whilst not in use, the manufacturers advise you don't need to fit a regulator/charge controller to prevent overcharging. For higher power demands, Towsure can supply panels from 10W to 80W as well as a variety of other solar equipment you'd ever need.